We can now carry on along the road until signposts show us that the Trail is heading cross-country again. We must cross the road carefully and head down the field, keeping next to the hedgeline. Before long we come to a kissing gate into the next field where there is often a major issue with poaching. No, not illegal slaughter of game birds, nor even the alfresco cooking of eggs, but rather the breakdown of soil structure caused by animals (and humans) plodging through it when it is wet. The problem here is that livestock like to congregate in the corners of fields if the weather is bad and there is some measure of shelter. It is also, let’s face it, good fun (if you’re a cow) to spook that small proportion of the human population that don’t like cows; getting the revenge in early for the whole calves-milk-meat thing, if you like. Anyway, the long and the short of it is that poached soil is gunk heaven and this gate leads through to one such spot. 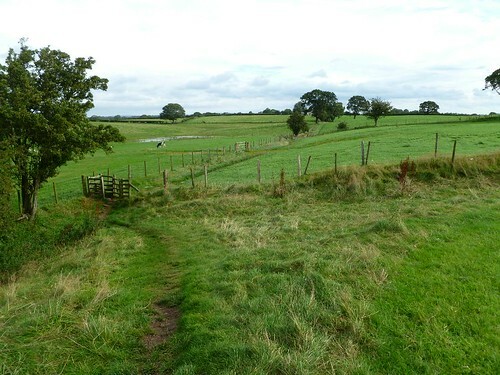 Once through the gate, we cross over the field boundary onto the berm (the ditch and the curtain wall are invisible here, both ploughed out, so you will have to take my word for it) and head south-westwards again. 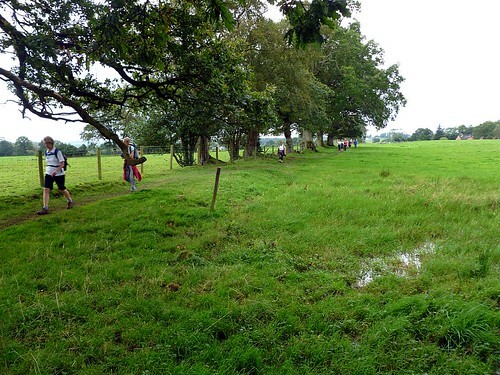 The ditch reappears once we pass into the next field and is conveniently marked by its resident hedgeline once more. We progress like this for some 420m, and then the Wall suddenly makes a turn onto an almost due-westerly heading. 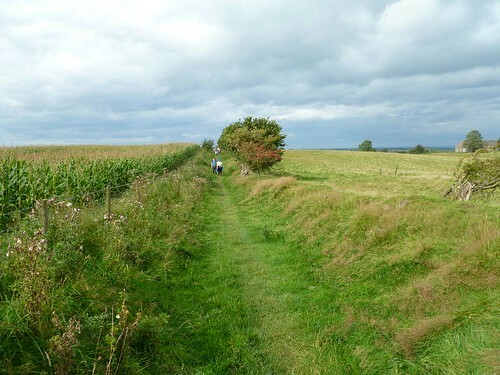 We pass through a gate into a narrow track, which sits on the berm between a fence to the south and hawthorn trees to the north, marking the curtain wall to our left and the ditch to our right. After only 240m of this we reach the location of Milecastle 59, which sat near the crest of the low hill we are assailing. 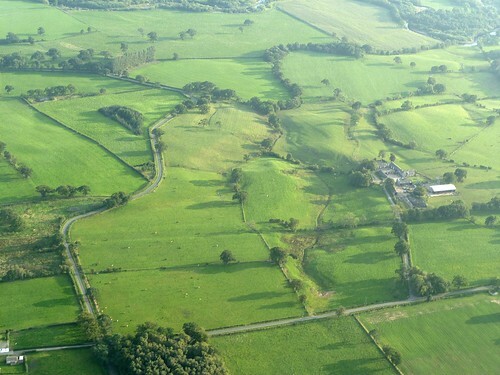 Milecastle 59 is beyond the hedgerow to our left and was apparently excavated by Hodgson in 1894. 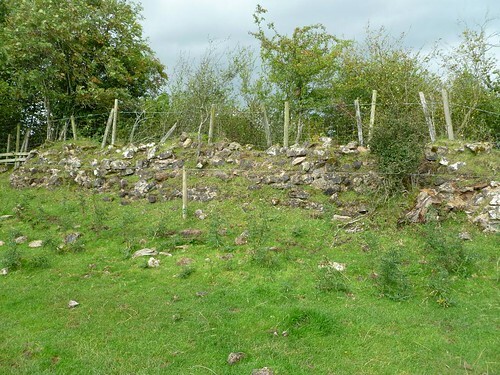 He found fragmentary remains and pottery, and one wall has subsequently been located by geophysical survey in 1980/1. Through the farmyard we go and out the other side, heading south-westwards, and now the field boundary is still in the ditch, but this time it’s a hedge. We cross a small stream by means of a bridge and then we are in the next field. 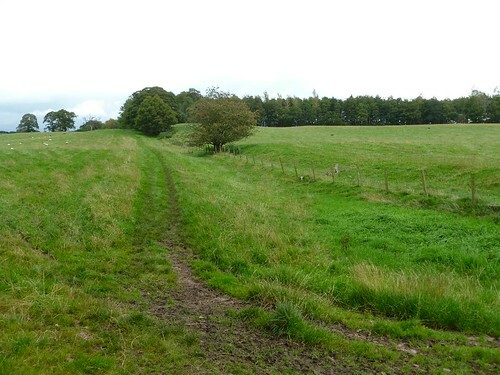 We pass to the north of The Beck’s farm buildings, not wondering for too long where all that red sandstone came from, and carry on across the floodplain towards the scarp ahead of us. Here, rather unusually, the hedge to our right is not on the line of the curtain wall, which is to our north. We scramble up the steps to get to the plateau by Heads Wood, where we will probably be greeted by at least one horse. 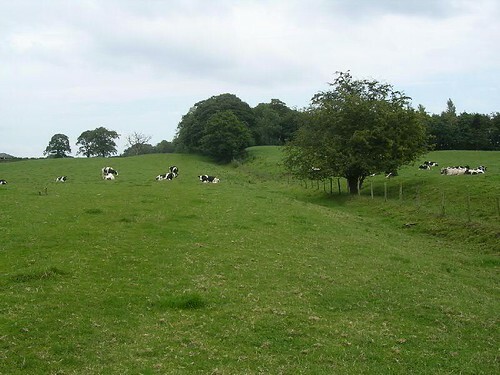 Across the paddock and into the next field, where we are back to a familiar situation with the ditch to the north, the hedge- and fenceline on the curtain wall, and us to the south of that. Through a gate, up a path, and then rather unexpectedly into somebody’s garden, through which the Trail passes. Veg looks good! 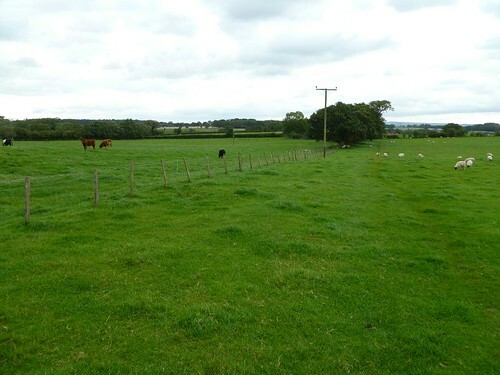 We weave our way through the back of a farmyard and then out onto the green at Newtown, next to the main road from Brampton to Longtown. Exercising caution (it is an A road so can be busy), we cross and continue south-west along the road. When the houses to our left end, we have reached the site of Milecastle 58. 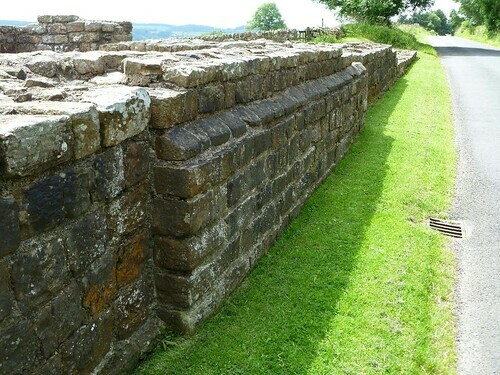 The milecastle itself (like the curtain wall) are set back from the road and it has not been located; so not only is there nothing to see, we don’t even know where it is in order not to see it! 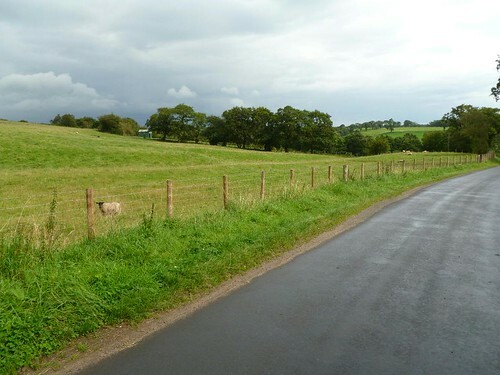 We follow the road for a short distance through the western outskirts of Walton before following the Trail off down a track to the right and through a gate. Emerging into an field, uncharacteristically, the line of the Wall is to the north of us, crossing open ground, and the field boundary immediately to our south has nothing to do with it. We dive into woodland and emerge to At the bottom of the field we cross a small burn, another tributary of the Irthing, and enter some woodland, climbing now as we go. Turning right at the top, we follow the track to the farm at Swainsteads and then head left past it, travelling along two sides of a triangle, the third side of which is the wall. Yes, it’s another detour of indeterminate purpose. Passing through the gate, reunited with the line of the wall, we head down the hill. noting how the fence line to our left is in the ditch, rather than on the mound covering the curtain wall. We plunge into more woodland and find a small wooded gorge that almost certainly had to be crossed by the Wall, just as the Trail now crosses it, by means of a bridge. One enterprising independent archaeologist claims to have found remains of the Roman bridge, but these have yet to be verified by excavation. 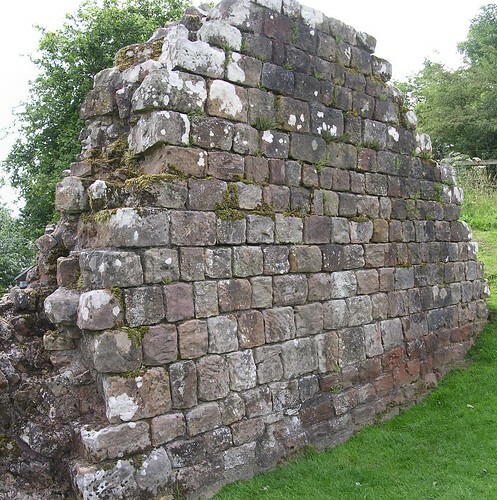 Remember, all water courses that passed through the Wall had to use culverts, small bridges, or major bridges (the last being the North Tyne, Irthing, and Eden. 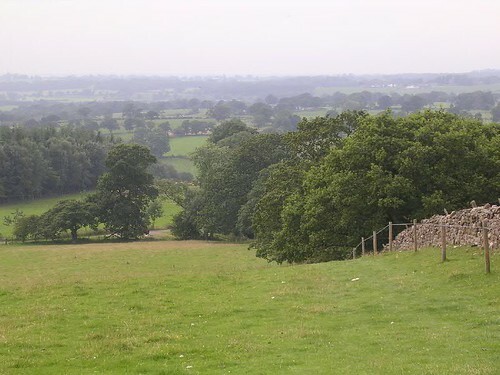 Up the other side and we are back out into the open, and it is time to pause and look up to our left at the wooded slopes above the Irthing, for here lies Castlesteads fort. 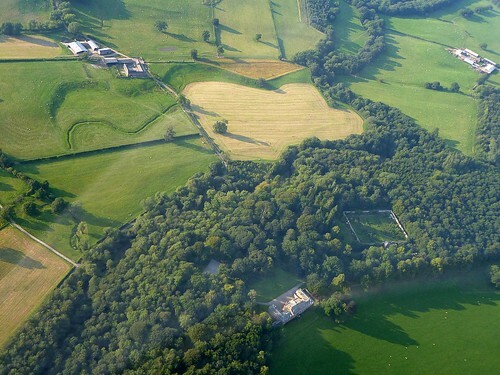 To your south, amongst the trees on the high ground beyond the Cam Beck (a tributary of the Irthing), lies the site of Castlesteads, one of the detached forts immediately south of the Wall (the others being Carvoran, Vindolanda, and – probably – Newcastle). 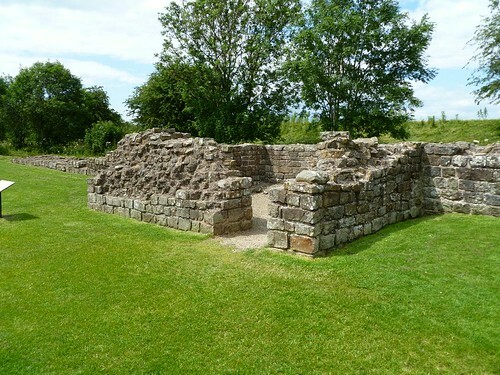 Neither Carvoran nor Vindolanda were within the Vallum, but it makes a very deliberate detour in order to include Castlesteads. 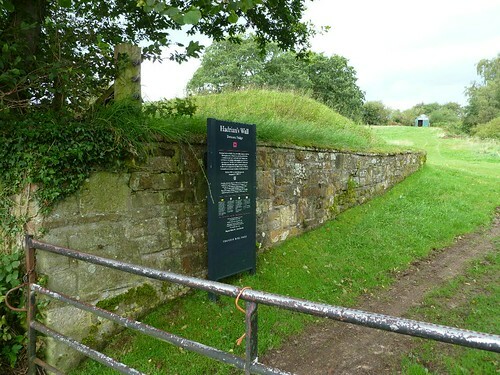 The fort lies 12.8km (8.0 miles) east of Stanwix and occupies about 1.5ha (3.7 acres: an informed guess, since the western defences have been eroded by the river). 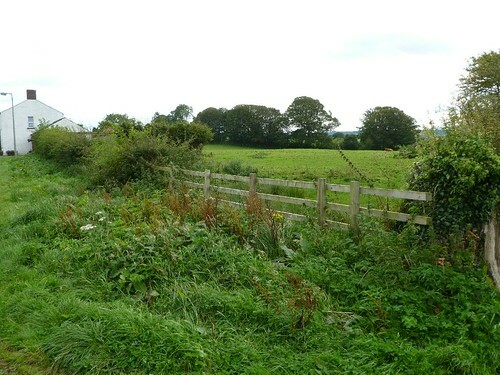 The site is on private land and has effectively been razed by the formal garden of a late-18th-century listed building, Castlesteads House, constructed on the site of an earlier Walton House belonging to the Dacre family. 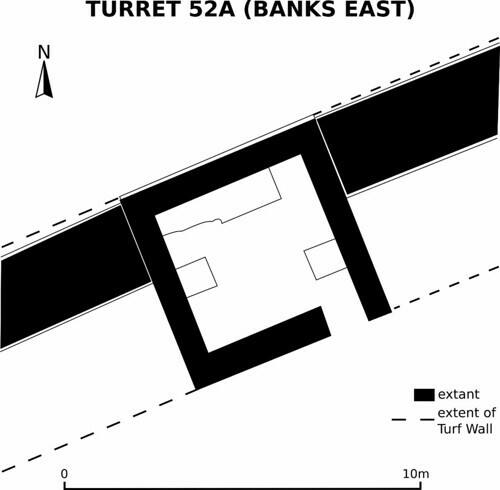 No trace of the fort is visible from the air, although the civil settlement has been detected by geophysical survey and the fort itself was summarily trenched in 1934, allowing the extent of its defences to be defined and the fact that the stone fort was preceded by a turf-and-timber one to be determined. However, even if you could see it, there is little to see. 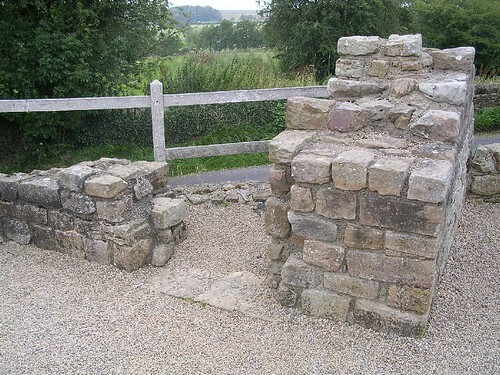 Inscriptions reveal that the units based here included the part-mounted cohors II Tungrorum and cohors IV Gallorum (who were also to be found at Vindolanda). The Notitia Dignitatum omits the garrison of Camboglanna whilst mentioning the fort, possibly a scribal error. 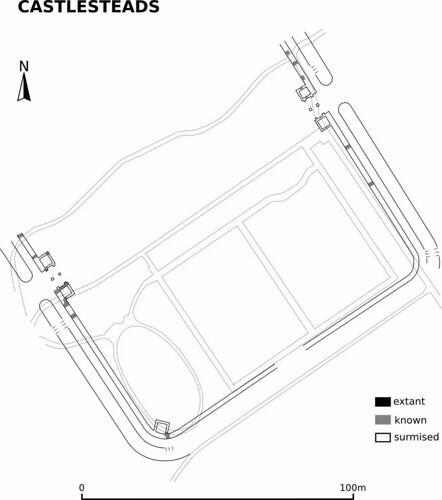 Old Ordnance Survey maps equated Castlesteads with Uxelodunum, all part of the confusion caused by thinking the well-preserved Watch Cross camp (now under Carlisle Airport) was a fort (we shall come to that later). Proceeding west towards Cambeckhill Farm, the ditch can just be distinguished as a slight depression with the modern fence still in it. Just before the farm, we reach the calculated site of Milecastle 57. 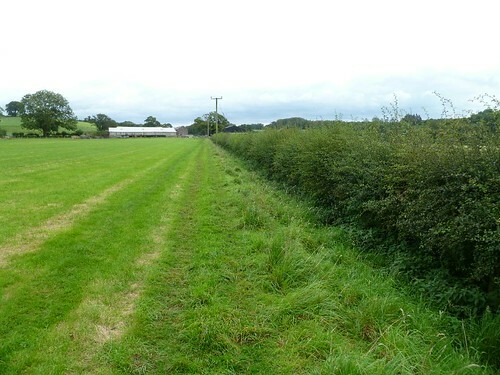 We follow the hedge line and fence which mark the line of the wall until we reach the western end of the field. The wall ploughs straight on, but we must now turn left down the (alarmingly busy) lane. For several years now, there has been a diversion in place that forces the murophiliac to stick to the road and risk the traffic to get down to Dovecote Bridge. Descending into the valley, the road bends round to the right and, crossing the bridge, we rejoin the original line of the Trail. Immediately after crossing the bridge, we may look through the gate to our right and see an English Heritage sign for a section of consolidated curtain wall that was formerly visible here during the summer months (being covered with straw and buried during the winter). Unfortunately, despite these precautions, the soft red sandstone weathered badly and the section had to be permanently buried. 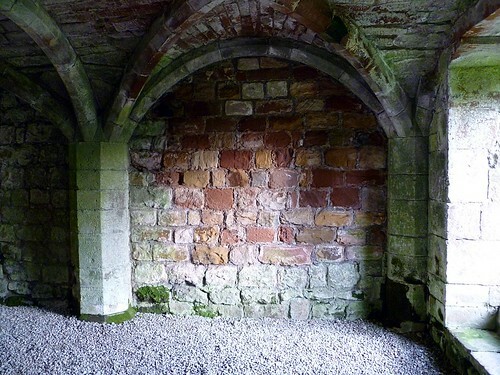 It would have been the westernmost portion of consolidated curtain wall, but now it is not. 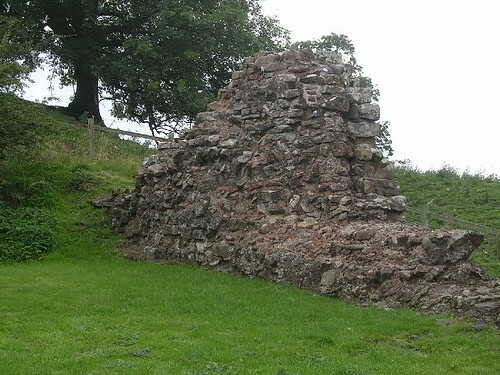 It is a reminder that exposure and consolidation is just the beginning of a long battle with the elements for the remains of Hadrian’s Wall. Reflecting upon this sobering message, we march on uphill to Walton, the ditch being clearly visible to our right. We pass through the village until we reach the road junction where, to our left, is the building that used to be the Centurion Inn. 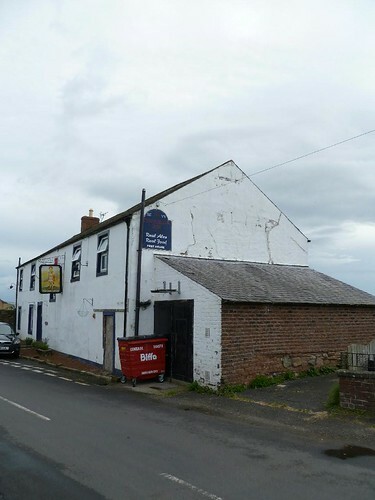 Milecastle 56 is assumed to lie beneath the now-defunct pub (which boasts an amusing cod-Latin date on its western gable end) but no trace has ever been found. 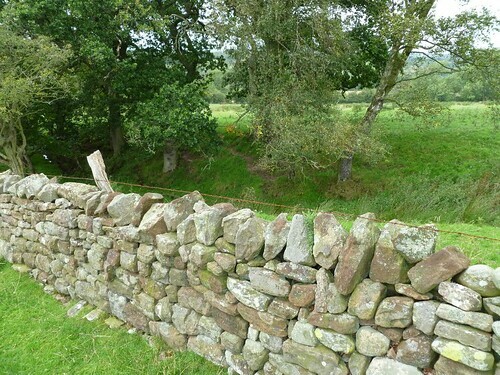 This used to be a good place for some map wrestling (the English Heritage Archaeological Map of Hadrian’s Wall is less sagely designed than its Ordnance Survey predecessor, being large and printed on two sides of the sheet, so always requires refolding near this point). 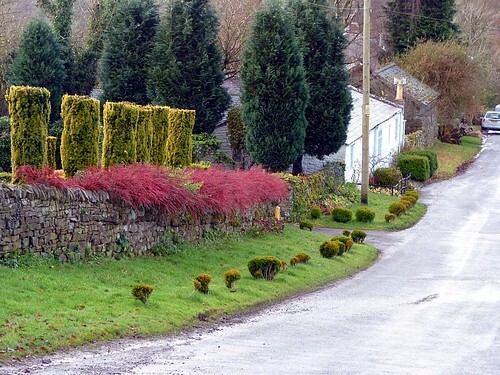 Now, deprived of the pub, the gasping walker may find sustenance if they turn right into the village and visit the tearoom in the village hall, beyond the play area.